Harter wanted to know about “little horses”, which are technically called miniature horses. What constitutes a miniature horse? According to the American Miniature Horse Association (AMHA), a miniature horse must not be taller than “34 inches at the withers, at the last hairs of the mane.” To contrast, thoroughbreds average 64 inches. Then what the heck’s a pony? 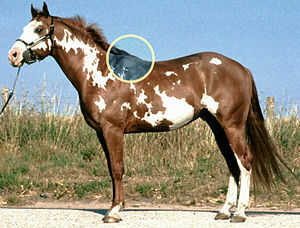 Ponies measure less than 58 inches, have “thicker manes, tails and overall coat,” shorter legs (proportionally), “wider barrels, heavier bone, thicker necks, and shorter heads with broader foreheads.” Ponies also retain juvenile features on their faces causing people “unfamiliar with horses [to] confuse an adult pony with a foal.” When looking at a picture of a miniature horse (of just the horse and no size reference) the miniature horse would look like a full-sized horse. Any clue when they first came about? Wiki says that as early as the 17th century they were “bred as pets for Europe’s Habsburg nobility.” AMHA says that the first mention of a miniature horse “being imported into the United States was in 1888.” Both sources state that the miniature horse comes from the bloodline of the Shetland pony. As always, well done…where can I buy one? If some one needs to be updated with hottest technologies afterward he must be pay a visit this site and be up to date every day.